Klewis currently is still in 1st place with 72 points! - Club Members & Staff Permitted to enter only. - 1st Place: 60% of money pooled. - 2nd Place: 25% of money pooled. - 3rd Place: 15% of money pooled. NB: MUST BE AT LEAST 6 GAMES IN THE ROUND TO WIN ANY WEEKLY PRIZE. NB: WEEKLY PRIZES MUST BE REDEEMED WITHIN 7 DAYS OF WEEKLY SCORES BEING PUBLISHED. - Best Tipper of The Week (500 Club Points) Determined by best weekly score, If more than one person gets top weekly scores each tipster still receives 500 Club points. 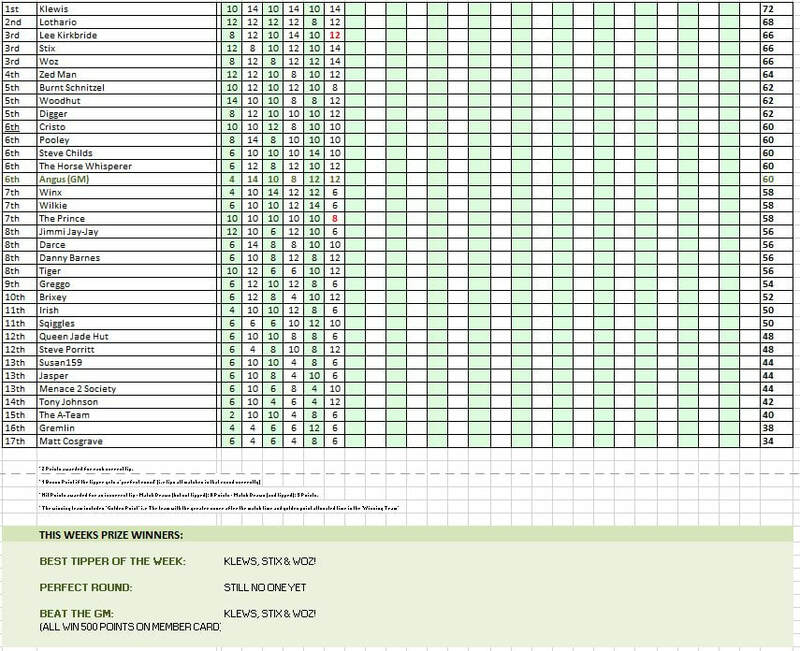 - Perfect Round (500 Club Points) Tipster has picked the correct selections for all games in the round. - Beat The GM: (500 Club Points) To ‘Beat the GM’ the tipster must get a score a greater round (not equal) than what the GM achieved. Tips can only be submitted at the club via the sign in terminals. Members must only submit their own tips weekly. - Updated by midday Wednesday each week. Weekly Prizes can be collected by midday Wednesday each week. Prizes must be redeemed within 7 days of weekly scores being published. - This Year Staff ARE permitted to participate in the competition (excluding Cristo Tracy & Angus Rimmer) they must pay entry and are entitled to win the end of year and weekly prizes.